W elcome to Namibia! Spring is a good time to think about all things ‘green’. After all, nature is pushing out green shoots all around us. Well, maybe it’s not so obvious in Namibia but if you look closely, the trees are starting to quietly bud and more ostentatiously show their flowering prowess around this time of the year. Spring is about fresh growth and new beginnings in nature, and perhaps it is a good time for us to review how we live, and just as importantly, how we TRAVEL. Do you strive to live a ‘green’ life at home, sorting rubbish for recycling, refusing plastic shopping bags, shopping thoughtfully and organically, only to toss all your good habits out of the plane’s window as soon as you step on board for a holiday? That may not be your intention, and it’s really quite easy to remain ‘green’ when you visit a new country. You may even save money, but more importantly the ‘feel good’ aspect is priceless and you will leave your host country better off than the average environmentally unaware visitor. Here are some tips for enjoying a ‘green time’ in Namibia. Choosing your airline can be a daunting task when travelling abroad, so choose an airline which offers you the option to offset your carbon footprint by supporting local environmental projects. Be sure to choose reputable options so that you know your money is going to a good cause and not being squandered. Of course the greenest option is not to fly, but then how would you get here? And we love having visitors in Namibia! Now that you have booked your plane ticket, the accommodation is next. Thankfully today more and more tourists go for ecotourism options and make sound choices when it comes to supporting establishments that subscribe to sustainable environmental practices which benefit the environment and staff as well as the local communities. If you choose a camping holiday it’s a good idea to support community owned camping sites whenever available. Visit www.travelnewsnamibia.com/news/community-based-tourism-go-camping-culture for a list of these sites but don’t expect to book in advance as most of them don’t have telecommunications. You can book on arrival, on a first-come first-served basis. If you are not into camping, keep in mind that most of our best lodges are situated in environmentally sensitive, pristine areas. Is the company you are considering doing all they can to lessen the lodge’s impact on that area? Visit www.ecoawards-namibia.org for a complete list of accommodation establishments around Namibia that have met the Eco Awards standards and earned ‘desert flower’ awards. Be environmentally aware and stay on the roads, always. Never ever drive off-road in our national parks or deserts just because you can, as it destroys the fragile ecosystems and leaves tracks and damage for eternity. Consult a map before you leave, so you don’t get lost and waste fuel. Or download www.tracks4africa.co.za on your GPS. Avoid unnecessary idling. It wastes fuel and disturbs others at waterholes. Make sure that you have the correct tyre pressure for the type of road you travel on. If the pressure is too low, fuel consumption goes up. Take your time and drive slower – it will save you fuel, especially in a 4×4! Open the windows and switch off the aircon when your speed is less than 60 km/h. Or you could decide to see our country from the saddle of a bicycle. 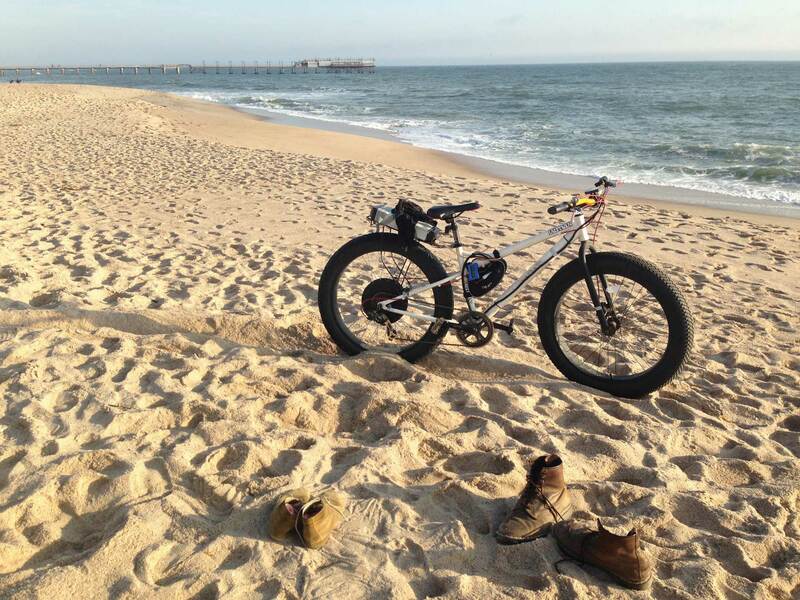 Visit www.suncycles-namibia.org or www.mountainbikenamibia.com for information of a more eco-friendly nature. Depending on how you spend your money in Namibia you contribute to the sustainability of projects both good and not so good. So it’s wise to do some research online before your visit. Join an exciting dune tour with a responsible operator and learn more about the small creatures that share the oldest desert in the world, the Namib. Visit Namibia’s World Heritage sites: Twyfelfontein for rock engravings and the Namib Sand Sea for, well, sand and scenery! 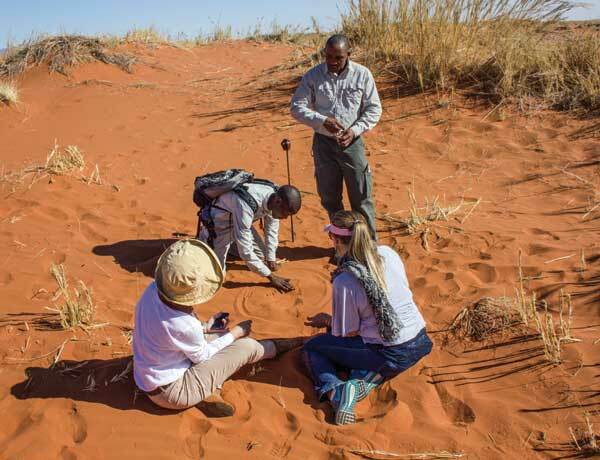 Rhino tracking in Damaraland is unique to Namibia and the fees go towards supporting rangers and research into rhino conservation. Visit one of Namibia’s five Ramsar Wetlands of Importance to see water birds: Walvis Bay Lagoon, Sandwich Harbour, Etosha Pan and Bwabwata-Okavango. No. 5, the Orange River mouth, has restricted access. Visit the Botanical Gardens at 8 Orban Street in Windhoek for an hour of fresh air and well-being. Free entry during office hours. It’s always a good idea to support local industry when on holiday. Buying at high street gift shops seldom supports local arts and crafts. Rather look out for craft outlets that are truly Namibian, e.g. The Namibia Craft Centre in the Old Breweries Complex in Tal Street. 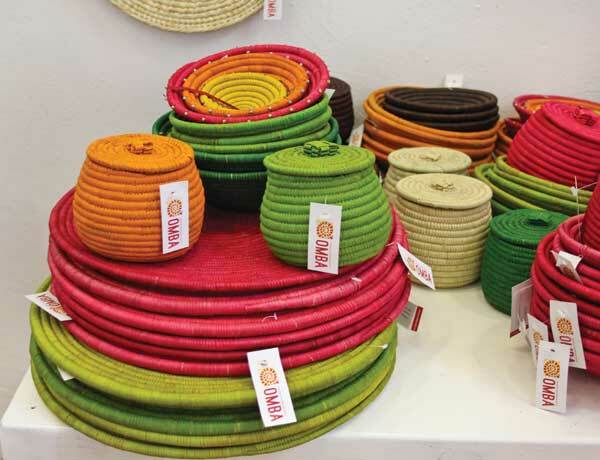 Home to more than 40 craft enterprises from all over Namibia, the centre encourages the use of environmentally friendly products and insists that the majority of products are locally produced. There is also an interesting café for the hungry, a stall stocking Namibian books and photographs and an art gallery which hosts a variety of interesting exhibitions. Ask for Namibian-made products to ensure you support local artists. Many curio shops stock large amounts of South African, Indonesian and Chinese products. If you are in Windhoek on a Saturday, pop over to the bio-market at Stefanus Church on Dr David Kenneth Kaunda Street in Klein Windhoek for the freshest selection of organic veggies, farm meats, Namibian honey and home-baked goods. Don’t forget to take your own shopping bags to the supermarkets even though plastic bags are unfortunately still given out freely in all shops. Maerua Superspar stocks locally produced organic vegetables and herbs, cleaning and body care products in their health section, as well as local venison in the Deli section and organic Cramer ice-cream. Ask the staff to show you where. As for skin care we are spoiled for choice with wonderful local products like Desert Secrets and Mbiri which use natural ingredients, including African myrrh (commiphora) collected by Himba people in north-western Namibia. Also try !Nara, Namibia’s new organic range of facial products, produced in Walvis Bay with the oil of the !nara plants from the desert. Omba Arts Trust is a project providing much needed income to far-flung communities in areas such as Khaudum or Nyae Nyae and the Zambezi Region. You will find handcrafted jewellery and homeware which make unique gifts. Their shop, Arti-San, is in the courtyard of the Craft Centre. Namibia is a dry, thirsty land. Bring or buy a reusable water-bottle so that you don’t add to the piles of plastic littering our beautiful landscape. We still have clean, drinkable tap water. Support our local beer (with names like Camelthorn, Tafel, Urbock – who can resist?) and wines from Kristall Kellerei and Neuras. Our venison is as green as it gets. Organic, free-range, lean, free of antibiotics and hormones, and harvested on site, it ticks all the boxes. Try to be a considerate traveller: switch off lights and aircon when you are not in your room, and only put your towels on the floor for washing when it is necessary. Resist the complimentary soaps and bottled water. The lodge can fill your reusable water-bottle anytime. Get some exercise. Sitting in the car over long distances makes one stiff and lazy! Opt for walking or running instead of that round of golf. Golf is the environmentally most unfriendly sport there is and denies access to some of the world’s most beautiful places in order to flatter the egos of a wealthy few. Rent a solar-powered bicycle from www.suncycles-namibia.org and get your phone solar-charged while you wait. With over 300 sunny days a year, Namibia has the potential to become the first carbon-neutral country in the world. Let’s support this awesome goal! Pick up one piece of litter everyday (or more). Try to have a technology-free trip. Get up early and listen to sounds. Take deep breaths of our fresh air. As you reconnect with nature, your connection with technology will release its hold on you. And that is why you wanted a green holiday. Right? This article was first published in the Spring 2015 issue of Travel News Namibia.